The budgerigar (or “budgie”), more commonly referred to as “parakeet” in the USA, is undoubtedly the most commonly kept parrot, if not bird, in the world. In fact, many think of the budgerigar as a purely domesticated species, and know little of its existence in the wild. 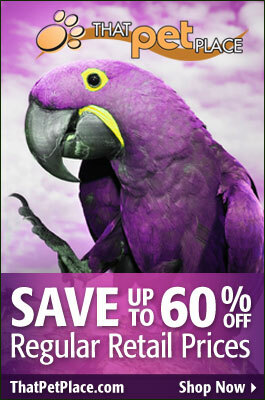 Yet it is Australia’s most numerous parrot, and arguably the most abundant bird on the continent. Today we will take a look at how it lives in the wild, followed by notes on captive care next time. Budgerigars are true parrots, and are classified along with all others in the order Psittaciformes. They are the only members of their genus. With so many captive bred color varieties available, it is easy to forget that the natural coloration of these 7 inch long parrots is quite beautiful. 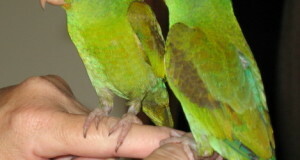 The upper body is barred in yellow and black, and the rump and under-parts are bright green. The forehead and face are a brilliant yellow. Feathers tipped in blue-violet decorate the cheeks and black spots mark the yellow throat. 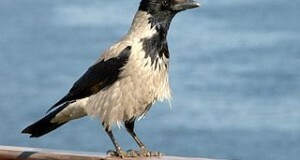 The cere (the area above the beak, where-in the nostrils are located) is blue in males, pink in non-breeding females and brownish in breeding females. Wild budgerigars are usually significantly smaller than individuals from captive-bred strains. The huge range encompasses nearly all of Australia with the exception of coastal regions and the Cape York Peninsula in the northeast (they sometimes appear in these areas during droughts). Budgerigars are absent from nearby Tasmania and New Guinea. Budgerigars have been reported as free-ranging in the USA, Japan, South Africa, Puerto Rico, Switzerland and New Zealand. Surprisingly, however, the only introduced breeding population seems to be in Florida. Many years ago I observed an escaped pet budgerigar take up with a flock of house sparrows in NYC. The budgerigar foraged and roosted with the sparrows and was never seen singly, but perished during the winter. Budgerigars favor sparsely wooded habitats along watercourses, dry scrub and grasslands, and sometimes enter agricultural areas as well. They occur in arid and semi-arid regions, but need to drink daily and so are to be found within flying distance of water. Droughts drive huge flocks to the coasts, and cause massive die-offs. Oddly at first glance, budgerigars often move into desert habitats during Australia’s frequent droughts. However, desert-adapted plants such as the various tussocks, bandicoot grass, salt bush and blue bush may support seeds even during the driest of years, and hence help to see the birds through such periods. However, the lack of water and low soil calcium levels (and hence low-calcium seeds) make the habitat far from ideal, and reproduction comes to a halt. Thank you for your comment and confirmation of my own (and often un-believed!) observation of a parakeet that took up with English sparrows. Budgerigars are quite social and are always found in large flocks in the wild. This characteristic suits them well as pets, as they are quick to bond with people if other parakeets are not about. It seems that, unlike many birds, sparrows are tolerant of other species and so the budgie will likely continue to spend time with them. The one I observed in NYC fed right in the center of the flock, and seemed not at all out of place (if you looked past his bright plumage!). I am guessing that the budgie will find enough food on its own, especially as the sparrows are seed-eaters and will likely lead the bird to their own food sources. Average winter temperatures in New Orleans should be well-tolerated, but putting out food will habituate the bird to feeding in your yard and guarantee it a food source during inclement weather. Many wild birds can, with patience, be induced to feed from the hand – if you are so inclined, the budgerigar might just become a free-living pet of sorts (an important point in hand-feeding is not to stare at the bird…look off to the side a bit). Years back I was a NYS nuisance wildlife trapper (amazingly, raccoons thrive even in the heart of Manhattan, along with opossums, flying squirrels and a host of other creatures). I received a call from a distraught man in the Bronx concerning his escaped scarlet macaw. The bird was sticking to the rooftops and trees, and would not come to the ground to feed. He asked if I might bring it to earth by “shooting it in the wing…just enough to knock off some feathers”! I gave him a few alternate suggestions, but never heard back. Thanks again for your comment. I’m very interested in feral wildlife, and would appreciate any updates you might have time to provide. Escaped grey-breasted parakeets, or monk parrots, have formed large colonies in several states, and now range to NYC and even further north. If you’d like to read more, please see my article on this blog: The Monk Parrot, Quaker Parrot or Grey-breasted Parakeet, Myiopsitta monachus – uncommon facts about a common pet bird, Part I & II. You’re in good company! Please let me know if you have any questions or observations about your own birds.